Tapping | Agam Group, Ltd. Tapping is the action of creating a thread in a piece of material, most commonly metal such as steel or aluminum. AGAM does approximately 1 million tapping cycles a year for various parts and multiple applications for its customers. AGAM owns 2 semi-automatic tapping machines. Depending on the tap, the operator will change the tapping head, with a pitch matching the tap size. After tapping is completed on the part, the machine has an automatic reverse cycle to extract the tap from the part. These machines have a powerful motor, driving multiple heads to complete 3 taps in one cycle. Such jigging aligns the parts perfectly and warrants accurate operations. AGAM also operates 3 flex tapping machines. 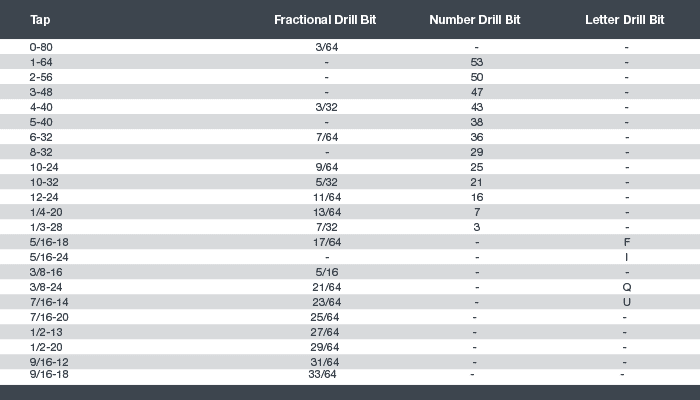 Such machines eliminate setup in a conventional milling machine, and reduce material handling by articulating the tapping head over the work piece. Typically, AGAM will cut thousands of parts on the Laser Cutting Center. Then, on such sheets of parts, an operator will tap each individual hole cut to the proper size. Such arms are air-powered, and have a self-reverse mode to extract the tap from the piece. Prior to tapping, a hole needs to be drilled at a lower diameter, slightly larger than the minor diameter of the corresponding male thread. 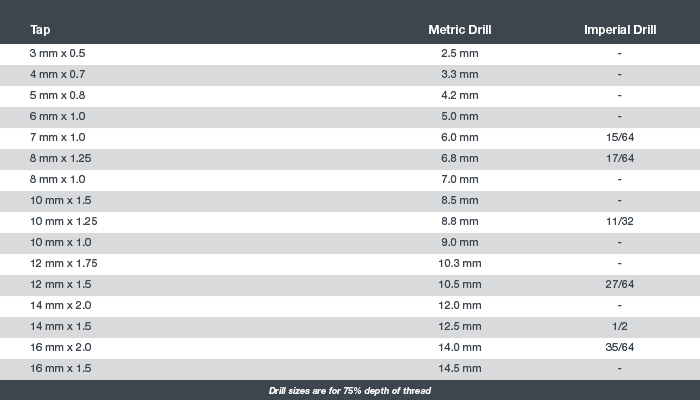 The above chart illustrates the drill size for a tap for the metric system. Alternatively, this second chart corresponds with the imperial system.